Why would you want to remove the bottom of a beer bottle? Well, in my case, I use the glass disk for a couple of reasons. 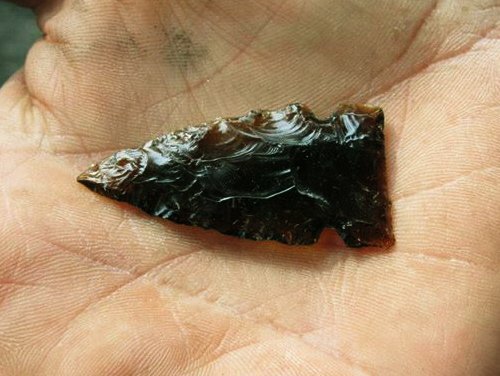 I have used the disk with it’s sharp edge as a cutting tool as illustrated in “Emergency Skinning Tool” but I also use the glass to make arrowheads. The thicker bottoms are preferred as they provide enough material to make straight edged points. I prefer the dark brown glass as it comes closer to resembling natural materials like obsidian, and is easier to see during the process of knapping. However, any color is serviceable for these applications. There are different methods to remove the bottle bottoms. One interesting method used for small 12oz. bottles is by using only your hand as illustrated in “Popping Off Bottle Bottoms By Hand“. Larger bottles become progressively more difficult and I have yet to break out a 40oz. bottle. For larger sizes I find that a metal rod works well. My friend uses a steel chisel or punch, blunt side down, inside the bottle and shakes it up and down while his thumb covers the top. I prefer to use tire irons and rebars to poke it out. In the past, when I have used a tire iron, I would place the blade parallel with the seam at the bottom to strike it. However, I found that it was easy to punch small holes in the process that could jeopardize the removal. Recently I discovered that I could rotate the blade slightly, say about 15 degrees inward or so and the bottoms would break out quite consistently in a single piece. Should you have the need for glass, bottles are easily obtained from trash or recycle containers and you can try these techniques for yourself. 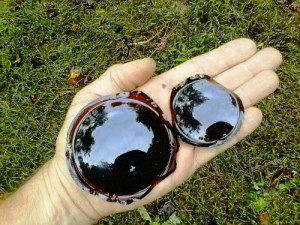 It’s wise to wear eye protection and perhaps sturdy gloves too. Don’t forget to pick up any glass shards left behind when you’re finished. This entry was tagged Beer, Bottle, Bottles, Flint knapping, Glass, Knapping, Skinning. Bookmark the permalink. You have come a long way Pilgrim. Where would one go to learn to do this, I’ve seen the results, but have never seen the actual work in progress.